A Riser Recliner is ideal if you have difficulty standing up or sitting down due to restricted mobility, e.g. MS, Arthritis, Rheumatism or circulation problems. These ingenious chairs will gently guide you into a standing or seating position with the use of a built in motor. The Riser Recliner can recline to a number of settings and also raise the footrest to give you a large choice of seating positions. What is the difference between single motor and dual motor? You can purchase a Riser Recliner with either a single or dual motor. Single motor riser recliners will lower the backrest whilst simultaneously raising the footrest, relaxing you into a comfortable laying position. With a dual motor riser recliner there are two motors which raise and lower the back and foot rests independently, allowing you an almost infinite number of positions to choose from. A dual motor riser recliner is suitable if you need to be able to sit up vertically but also keep your legs raised. Once you have decided on your motor type then the most important decision is on the style of chair and fabric choice for your Riser Recliner. We have a wide range of chairs available in various sizes so it is important to choose a chair that will fit in your home. Be sure to allow room for the chair to recline. 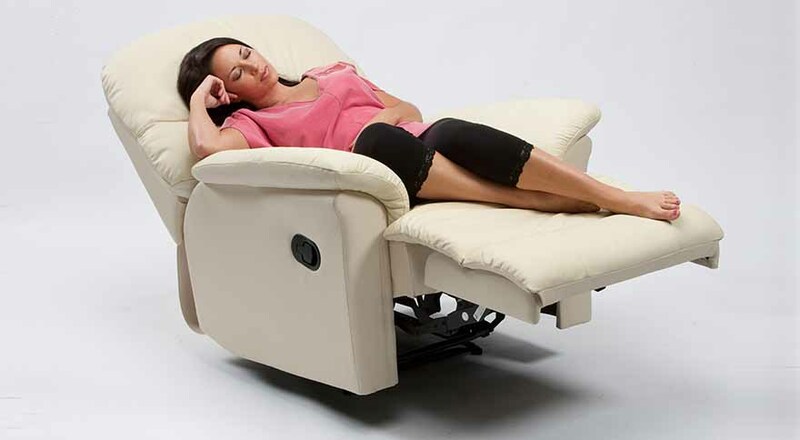 All of our Riser Recliners are beautifully made and offer great comfort. Many have a memory foam cushioning for extra support and comfort. All models are available in a wide range of colours and fabrics and we are confident that you will find a chair that will look beautiful in your home. If you need any further advice, please contact us. We’d be happy to help.